Hola! And Bienvenidos to the Electronic Medical Record project. My name is Zack Ballinger. I am a rising 4th year majoring in both Biology and Cognitive Science. This year, I’ve had the privilege to travel to Xela, Guatemala to work on the design and implementation of an Electronic Medical Record system in the National Hospital in Totonicipan, Guatemala. The project team consists of our mentor, Dr. David Burt of the UVA Medical System, Kevin Carlson (a UVA medial student), Jessica Gonzales (Guatemalan project coordinator), Ivan Castellanos (Guatemalan IT director), Roberto De’Leon (Guatemalan Computer Engineer), as well as several past years of research contributed by other teams of students both in the US and in Guatemala. We are also working closely with several doctors in the Toto hospital, namely Dr. Scarlet Lopez and Dr. Hector Medina, and their respective students to receive feedback on our system. Well before any team member arrival in Guatemala, years of research were completed into Electronic Medical Records, Trauma Data Registries, and the Guatemalan Health System. It was concluded that individuals benefit from EMRs through the reduction of medication errors, increased disease prevention and the management of chronic diseases (as compared to systems with paper records, like those in Guatemala). EMRs allow for the improvement of patient safety through a system of automated warnings in the event of abnormal patient circumstances. Additionally, due to the fact that 90% of death due to traumatic injury occurs in developing nations, collection of data related to traumatic injury (as outlined by the Pan American Trauma Society) allows for more accurate management of pre-hospital treatments, in-hospital care, and post-discharge outcomes for individual patients to assure best outcomes for patients. Not only does electronic record keeping allow for the protection of data in the event of a natural disaster, data can also be easily retrieved by researchers, physicians, or other clinicians to survey and track communicable diseases, run diagnostic quality improvement measures in specific hospitals, and more accurately track public health data. EMR implementation in Haiti, Cameroon, Kenya, Peru, Uganda, Malawi, and Brazil have all demonstrated the benefits of EMRs in resource-limited communities. 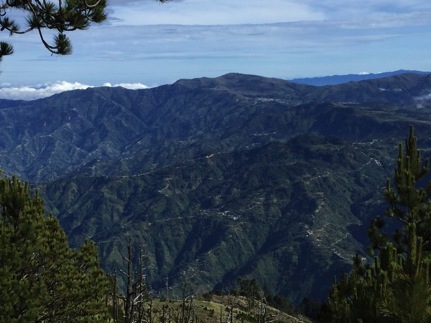 Previous work by the Guatemala Initiative suggests that clinics within the Guatemalan Highland region may benefit from the implementation of an electronic medical records system. Initial work in the region has shown that multiple record keeping systems, both paper and electronic, are often used within a single clinics. This resulted in disorganized and even irretrievable data, many times forcing patients to be treated without any previous records. Our study, then, will build on the former and current UVA-GI in-country research of Huntington & Sherwood and French & Coes, the former of which examined proprietary and non- proprietary EMR models best applicable to resource-limited environments and the latter of which examined EMR system requirements. Work preformed by University of Virginia School of Medicine students, Taylor Huntington and Kyle Sherwood, on the ground in the region assessed numerous clinics as possible sites for the implementation of an EMR system.18 This and ongoing work by the Guatemala Initiative identified Hospital Nacional Jose Felipe Flores as an ideal candidate for implementation. As a teaching hospital, this clinic maintains a staff of computer literate medical students eager for the step to electronic records. Prior to my arrival in-country, Dr. Burt and UVA students Emory Buck and Sarah Perez developed a comprehensive list of information required of a basic EMR system. This list includes all the information required by the Pan American Trauma Society, the organization that decides the minimum data required for effective trauma patient data analytics. UVA medical student Kevin Carlson spent the previous 6 weeks working closely with Jessica Gonzales, Ivan Castellanos, and Roberto De’Leon to develop an EMR based on this list of information. Kevin and the team were able to generate a series of pictorial representations of what the final EMR will look like. These representations were critiqued by the team of doctors and students at the Toto National Hospital through several iterations. I arrived in Guatemala 3 weeks ago. During this time, I have been taking rigorous Spanish classes at the Celas Maya Spanish School in Xela. I atteneded Spanish class Monday – Friday from 8 am to 1 pm. After lunch (the largest and most elaborate meal in Guatemala), I met with Kevin and the team to discuss updates to the project. As of last week, Kevin’s last week in country, we have completed the final version of the ‘pre-EMR’ representations. Now that the content and layout of the EMR are finalized, Roberto can begin to build an online version of the system with full functionality. Additionally, I will be creating fillable-PDF forms from the test images of the EMR as a rudimentary, placeholder system to test in the hospital while the full system is built by Roberto. Additionally, Dr. Burt is working stateside to recruit a software engineer to build an offline, proprietary EMR system akin to those used in US hospitals. Though the combination of work and Spanish school has kept me extremely busy, I have been lucky enough to have the opportunity to explore this wonderful country. My first weekend here, a group of UVA students (and one new friend from Alabama) traveled to Monterrico, the most famous beach in Guatemala. 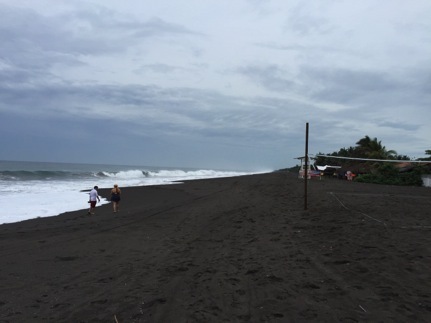 This beach is one of the famous volcanic, black-sand beaches of Central America. The huge waves, good friends, cheap tequila, and sunrise trip through the nearby Mangrove Forest made it a weekend to remember forever. Amazingly, I had an equally fantastic trip with several students from Celas Maya the following weekend. We scaled Tajumulco, the tallest volcanic peak in Central America. 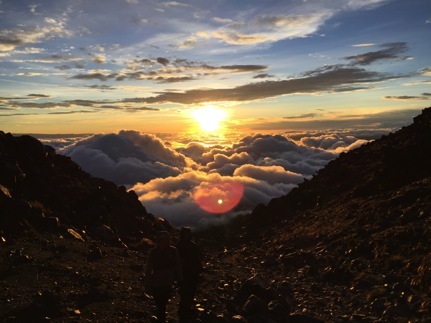 Though the 7 hour hike to camp was difficult, to say the least, and the summit at 4 am was bitterly cold, I think the stunning images of the sunrise were well worth the duress. As I am now halfway through my time here in Guatemala, I cannot wait to continue to explore the magnificent city of Xela. I hope the second half of my trip can be as productive and memorable as the first half.